Alessio da Seregno ( †1448), active at the Councils of Pisa, Constance and later at Basle (since 1431), was bishop of Piacenza and author of several theological works. He composed sermons on the Virgin Mary and for the liturgical year, surviving in two MSS. Here his sermons for Lent are edited, with identification of loci paralleli and sources: among these the Franciscan masters St Bonaventure of Bagnoregio and Alexander of Hales are most frequently recurring. The text structure, the great number of theological details and passages of pastoral use suggest that these sermons could be used as models for preaching to lay congregations. The library built in the mid-15th century by the Lord of Cesena Malatesta Novello still preserves 343 manuscripts. 126 out of these codices were copied and illuminated for him. The activity of the Malatesta scriptorium covers a period of about twenty years, from 1446 to 1465, when Novello died. This corpus, consisting of manuscripts written in a relatively short period, and commissioned by the same person, represents an excellent field for researches in palaeography (scribes, handwriting, identification of anonymous copyists, and so on) and codicology (ruling, decoration, binding, and so forth). The present project aims at identifying one of the features of the parchment used in the scriptorium, by measuring the thickness of the leaves composing the quires of each manuscript. The collected data have been subjected to a basic statistical treatment and compared with the (unfortunately rare) similar data, drawn from contemporary or older manuscripts. Between 1529 and 1530 Pietro Bembo moved again to Venice as official historiographer of the Republic, after the death of his friend Andrea Navagero. This paper traces the genesis of the Historiae Venetae and points out the role played by one of the most important voices who helped Bembo in this juncture, Niccolo` Tiepolo (1483-1551). The second part of the paper is devoted to Tiepolo: his biography, his connection with Bembo, and his poetical work: the discussion focuses on problems of attribution of the poems and their transmission in manuscripts and XVI-century printed anthologies. The history of the Vatican Library from Nicholas V to Clemens VII is outlined after the volume "Le origini della Biblioteca Vaticana tra Umanesimo e Rinascimento" (1447-1534), edited by Antonio Manfredi (2010). Several medieval inventories and catalogues of the papal library exist, drawn before and after the official foundation in the XVth century, and are mostly, but not all, mentioned in Manfredi’s volume. The present paper offers a complete and annotated list of all the inventories and catalogues of books owned by the popes, from the first known (1277) to 1566. Lionardo Salviati published his own rassettatura of Boccaccio’s Decameron in 1582 after at least two years of work. The purpose of his work was twofold: a massive censorship in order to make the Decameron acceptable to the Roman Inquisition, and the recovery of the 14th century original vernacular language. The present essay explores the philological work undertaken by Salviati in order to restore the Decameron true reading (the so called ‘vera lezione’); Salviati clearly choosed to recover and follow the Mannelli codex variants against the choices of the Florentine deputies and of the 1527 Florentine edition. Therefore Salviati’s rassettatura is not a simple descriptus of the deputies’ edition, but it aims to be a renewed Decameron as well from the moral point of view as from the linguistic and philological one. Twenty-four unpublished letters, dated 1611-1612, provide documentary evidence for the biography of the sender, the Bolognese poet Girolamo Preti (1582-1626), and are an important source for the history of the Ambrosiana Library, founded in Milan by cardinal Federico Borromeo. Indeed Preti was charged by the cardinal to purchase volumes for the library and the letters contain a number of lists of printed books and manuscripts. From his letters Preti appears in friendly relationship with Girolamo Aleandro, Alessandro Tassoni, and other members of Roman literary circles; for the benefit of the Roman Accademia degli Umoristi Preti convinced cardinal Federico to give a relic of S. Carlo Borromeo. In the early XVIIth century in Valle Camonica, a valley of the central Italian Alps, public officials of the Commune made use of antiquities and medieval archive documents in order to assert the rights of their own land, providing an example of connections between historical scholarship and political affairs. Chancellors of the Commune were in fact engaged in some correspondence with contemporary antiquaries: chancellors Bernardino Ronchi and Alberto Isonni with Ottavio Rossi, a widely known scholar, and with Pietro Paolo Ormanico, an acute reader of classical inscriptions, both from Brescia. Meanwhile, Rossi and Ormanico, but also Philippus Cluverius, professor at Leiden, were able to establish on new foundations the ancient and medieval history of that region: sources for their studies were Roman inscriptions, relevant to the Tribus Quirina and Res Publica Camunnorum, and ancient geographical works, medieval Latin chronicles and medieval epigraphic monuments. A lost manuscript formerly in the library of the canons of S. Salvatore in Bologna was seen by abbot Luigi Mingarelli, who quotes two Latin inscriptions from it in a letter to the antiquarian Gaetano Marini (1790), preserved in MS Vat. Lat. 9053. The letter is here edited. The description given by Mingarelli attests to a connection between this lost manuscript and two other codices containing the first recensio of the epigraphic collection traditionally known as signoriliana (MSS Vat. Barb. Lat. 1952 and Venice, Marc. Lat. XIV, 264). Several occurrences of some colloquial syntactic structures (left and right dislocation of direct object, che as a multipurpose conjunction) may already be found in Manzoni’s first draft of his novel, the so called "Fermo e Lucia". However, other types of informal constructions, such as dislocation of prepositional object and relative clauses with resumptive pronouns, become frequent only later, in the last edition of 1840-1842. The latter structures are all characterized by a high level of redundancy, which seems therefore the feature that Manzoni more strongly associates with breaking free from the tradition. On the other hand, parting from literary standards does not necessarily mean, as it is currently assumed, moving toward the spoken language, because some of the constructions that are used exclusively in the dialogues of the novel (right dislocation of direct object, cleft sentence) show a low level of redundancy, and some redundant structures are used by Manzoni just in narration. A letter of Alessandro Manzoni sent to count Bernardo Pallastrelli on 17 May 1862, known to the editor of Manzoni’s "Tutte le lettere", but supposed to be lost, has just emerged on the antiquarian market. A new edition is given from this recovered autograph, and a letter written by Pallastrelli to Manzoni on 12 July 1868 is also published. Pallastrelli was a learned nobleman and a scholar, author of texts on the history of his city, Piacenza. Twenty years of relationship between the philologist and literary critic Gianfranco Contini (1912-1990) and the extraordinary printer Alberto Tallone (1898-1968) are recorded in letters kept both in the archive of the typography at Alpignano and among Contini’s papers in the Fondazione Ezio Franceschini (Florence). In 1946, on the initiative of Tallone, then active in Paris, Contini accepted to prepare an edition of Petrarch, "Rerum vulgarium fragmenta", which appeared in Paris in 1949. The letters tell the many problems posed by the text and the cooperation between the philologist and the typographer in order to produce a splendid book. Vent’anni di relazione tra il filologo e critico letterario Gianfranco Contini (1912-1990) e lo straordinario stampatore Alberto Tallone (1898-1968) sono testimoniati dalle lettere conservate sia nell'archivio della tipografia di Alpignano che tra le carte di Contini custodite dalla Fondazione Ezio Franceschini (Firenze). Nel 1946, su iniziativa di Tallone, poi attivo a Parigi, Contini ha accettato di preparare un'edizione di Petrarca, la Rerum vulgarium fragmenta, stampata a Parigi nel 1949. Le lettere inedite raccontano i tanti problemi posti dal testo e la cooperazione tra il filologo e tipografo al fine di produrre uno splendido libro. A set of unpublished letters by Vanni Scheiwiller allows to reconstruct the events behind the 1963 Viareggio Literary Prize, one of the most turbulent editions in the history of this prestigious award. Moreover these letters shine a new light on Scheiwiller’s role in promoting dialectal poetry, in particular that of the Grado-born poet Biagio Marin, whose works had been published by Scheiwiller in Milano since 1961, starting with the anthology "Solitae" edited by Pier Paolo Pasolini. In the Appendix, the edition of some excerpts of an unpublished correspondence between Pasolini and Marin and between Marin and Scheiwiller explains the editorial phases of "Solitae". This essay traces the influence of Montale on Calvino’s work. An explicit aim at imitating Montale marks already Calvino’s early and still insecure poetic attempts. In the same way, themes and symbols of Montale’s "Ossi di seppia" and "Occasioni" appear in works such as "Sentiero dei nidi di ragno" as well as in Calvino’s short stories ("Racconti"), and more generally in his works of the Fifties and Sixties. Moreover, Calvino considered Montale an exemplary writer, able to affirm the highest moral and civil values during the fascist period and who, in the post-World War II period, defended his ’creative loneliness’ with respect to the futile communication rituals of modern mass culture. E. FUMAGALLI, Il giusto Enea e il pio Rifeo. Pagine dantesche (P. Frare), p. 1215 - CICERONE, «Pro Marcello». Volgarizzamento toscano gia` attribuito a Leonardo Bruni, a c. di S. BERTI (S. Brambilla), p. 1220 - B. FLAVIUS, Italia illustrata, I, a c. di P. PONTARI (F. Della Schiava), p. 1222 - T.L. FRULOVISI, Claudi duo, ed. critica, trad. e comm. a c. di V. INCARDONA (E. Romanini), p. 1223 - T. DE MEZZO, Epirota, a c. di L. RUGGIO (A. Bellieni), p. 1224 - L. GERI, A colloquio con Luciano di Samosata: Leon Battista Alberti, Giovanni Pontano ed Erasmo da Rotterdam (G. Tomassi), p. 1225 - M. PELLEGRINI, Religione e Umanesimo nel primo Rinascimento. Da Petrarca ad Alberti (V. Marchesi), p. 1227 - S. BIANCARDI, La Chimera di Carlo VIII (1492-1495), presentaz. di G. ANDENNA (A. Slerca), p. 1229 - S. SIGNAROLI, Maestri e tipografi a Brescia (1471-1519). L’impresa editoriale dei Britannici fra istituzioni civili e cultura umanistica nell’occidente della Serenissima, pref. di L. GARGAN, indici a c. di E. VALSERIATI (A. Ganda), p. 1231 - Un erudito bresciano del Settecento: Giammaria Mazzuchelli, a c. di F. DANELON, con la collab. 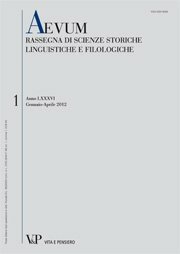 di C. CAPPELLETTI (F. Forner), p. 1233 - V. TROMBETTA, L’editoria a Napoli nel decennio francese: produzione libraria e stampa periodica tra Stato e imprenditoria privata (1806-1815) (A.G. CAVAGNA), p. 1234 - L’Europa del disincanto (Dal ’68 praghese alla crisi del neoliberismo), a c. di F. LEONCINI (J. Krˇesa´lkova´), p. 1236 - Klasyk na luzie. Rozmowy z Bohdanem Zaduraa˛ [Un classico in liberta`. Colloqui con Bohdan Zadura], [cur.] J. BOROWIEC (J.W. Wos´), p. 1240 - Il discorso accademico. Lingue e pratiche disciplinari, a c. di P. DESIDERI, G. TESSUTO (C. Milani), p. 1242.